I thought I would do a quick post to share some of my current beauty favourites! BOURJOIS Air Mat foundation - I recently got this foundation and I absolutely love it. My review will be up very soon! BOURJOIS healthy balance powder - I love switching up my setting powders now and again and I have recently fallen in love with this powder! It smells amazing like all bourjois base products do and it lightly sets your makeup in place without looking heavy and cakey! Maybelline Lash Sensational Waterproof Mascara - I purchased this a few months back after hearing this was a dupe for the Benefit They're Real and I really loved using this when I was in America for when it was humid! Smashbox Blush/Soft Lights Duo in Super/Model - I personally loved the highlighting shade in this duo, it is very similar to Kitten by Stila!! I love the Maybelline Lash Sensational mascara too, it works wonderfully! I'll have to check out that Smashbox duo! Stila Kitten is one of my faves! I've always wanted to try the Maybelline Lash Sensational Mascara! I've heard such good things about it, definitely going to pick it up soon! 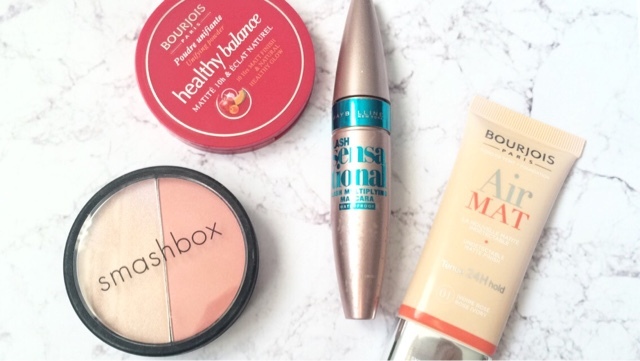 I love the Bourjois Healthy Balance Powder - my favourite drugstore powder!